﻿ China Wire Rod Price Index from Jan. 01 to Apr. 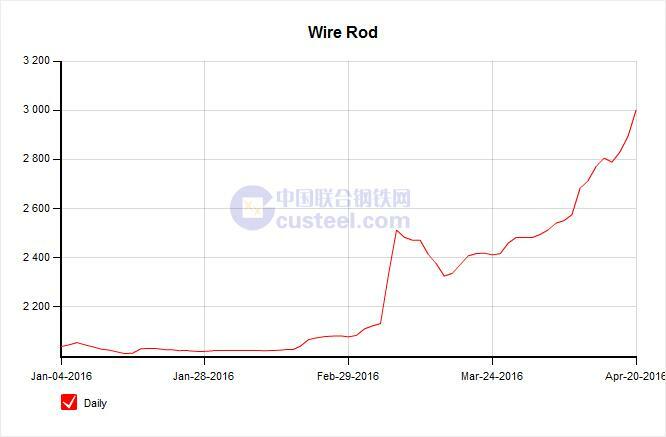 20, 2016 - Anping County Zhuoda Hardware Mesh Co., Ltd.
China's wire rod price has been rising sharply over the past thirty days, it was RMB 1860/Ton at the beginning of March, but now it already stand up to RMB 2990/Ton, the rate of increase is higher than 60%. Many wire mesh manufacturers feel headache in making quotation to clients as the wire rod price may rise four times one day. Here is the wire rod price index from Jan. 01 to Apr. 20, 2016 from Custeel. Wire rod is used to produce wire products that are used in a range of sectors, including construction, industry, farming and mining, as well as for fencing applications.